Is the cold weather turning you into a recluse? Are you visiting Prague with children wondering how to keep them entertained? We’ve pulled together a list of some great indoor (and outdoors if you wrap up warm!) places to take kids to within Prague that will be sure to keep the winter blues at bay. It may be freezing outside but why don’t you skate away the urge to hibernate whilst improving your balance through fun exercise! Ice-skating is one of Prague’s favourite pastimes, especially in the winter months and the fresh air and company of others will certainly help to de-stress and revitalise. Dave Park has kindly provided a roundup of Prague’s best ice-skating rinks, here. Admissions range from Free- 120 CZK and boot rentals range from 50-80 CZK. Come on, get your skates on! Even if you don’t want to venture out into the cold, you can still exercise indoors and make a splash in some of Prague’s best swimming pools. Šutka Aquacentrum is home to one of Prague’s two 50m indoor swimming pools as well as a water river. Entrance fees for adults begin at 125 CZK for an hour and 80 CZK for children under 15 years. The Šutka Aquacentrum palace is located at Čimická 848/41, 182 00, Praha 8. Prague TV have provided a list of some of the other best places to go for a swim in Prague, here. You could stay warm by seeing what the National Theatre has to offer. 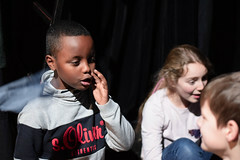 The National Theatre lists a number of productions suitable for children with a 20% discount on tickets for children under 15 years during morning and afternoon performances. It might be worth checking out Hansel and Gretel, which is a magical fairy-tale opera appropriate for children 5+ and the whole family! There is a morning performance on 5th February and prices start at 390 CZK. You can find out more about the National Theatre for children and see the whole list of performances, here. Dance into Spring at the Children’s Studio of the PONEC theatre. Check out the list of dance performances suitable for children here. You can find the theatre at Husitská 24a/899, 130 00, Praha. A relatively new and very large indoor play centre in Prague’s Zlicin district which boasts a massive range of attractions including giant megaslides, indoor bobsled, a climbing centre, bouncy castle, jump park, electric cars, and much more. Full details, prices and opening hours here. You could try something completely different and attend a yoga class. Yoga is a great way to beat the winter blues. Studies show that regular yoga practice can improve your mental health and it is a great way to boost circulation in the cold winter months. Melanie Hawker teaches classes which give parents and babies the opportunity to exercise as a family in an engaging and relaxing manner and children the opportunity to relax whilst having fun through music, props, games, stories, meditation and relaxation. Melanie teaches Kids Yoga at Yoga Karlin every Wednesday (3:15-4:15) and at Joga Letná every Sunday (17:30-18:30). Classes cost 160 CZK at Yoga Karlin and 190 CZK at Joga Letná with 10% off for extra siblings. Melanie also teaches Parent and Baby Yoga at Yoga Karlin every Monday (10:00-11:30) which costs 200 CZK. Joga Letná is located at Dobrovského 666/20, 170 00 Praha 7, Holešovice and Yoga Karlin is located at Březinova 13, Praha 8, Karlín. What’s better than visiting a cosy bookstore in the depths of winter? The Globe Bookstore and Café is the first English bookstore in Prague and is also home to a lively café which offers a great full American brunch menu at the weekend. On Sundays, the bookstore hosts Sunday Story Time- a free event that allows children to enjoy English language stories, activities and crafts. Children will be supervised giving you the chance to unwind with a Sunday brunch at the café.
. You can visit their website, here.